Nearly every climate study investigates the relationship between greenhouse-gas emissions and temperature changes, but it is rare that temperature changes' signification for various kinds of impacts is looked at in any more detail than a bulk approximation. An article published last year in the journal PNAS attempted to refine projections of impacts, separating them into four 'sectors' (water availability, crop yields, species loss, and disease risk) that were examined regionally. The authors assumed temperature changes consistent with the most-extreme emissions projections, the Representative Concentration Pathway [RCP] 8.5 pathway — which might seem alarmist, except that this figure from the first IPCC report in 1992 shows that's the route that we're on. They then used standalone impact models to estimate the temperature at which impacts they defined as "severe" would occur for each sector and region, with severity being, qualitatively, a rapid shift relative to historical values. After all, it's the speed of change that matters most for the natural world; CO2 values have been much higher in the (warmer) past, but rose there very slowly, allowing species to adapt. The below figure from the paper indicates that by this methodology, perhaps surprisingly, large numbers of people (i.e. major urban areas) will likely not be directly impacted by climate change until temperatures climb 3 deg C or so above 1980-2010 values. At that point, southern Europe, western Africa, Central America, and parts of South America will experience water shortages and crop-yield decreases, while large areas of the globe (particularly the Arctic and high-altitude regions) will be undergoing significant ecosystem disruption. However, 1 percent of the global population is still more than 70 million people, and just one sector's impacts could very well be devastating (witness the current drought in southern Brazil). One has to be cautious about making too-firm conclusions from the results of this approach, though. The percent of population impacted is in large part a function of the definition of what constitutes an impact, and of the assumption that the four sectoral impacts are equal in importance. Breaking down the sectors and examining the map of regional differences shaded by degree of model agreement (below) disentangles the data from the authors' assumptions and makes clearer which sectors will be of most concern where. Crop-yield decreases and water shortages are the two results that are most robust across studies, and are least likely to diminish with increasing wealth (unlike, say, malaria risk). This consideration leads to different and generally more-serious conclusions, especially for rapidly urbanizing areas; for example, northern India and West Africa show near-term crop-yield vulnerability (panel b) that has the potential to affect many hundreds of millions of people. But because those areas are projected to experience less water and ecosystem stress, and already have endemic malaria, they aren't included in the graphs above, and don't show up as regions of concern in the maps below. Another reason to be wary of concluding too much from a study like this lies in the impact models used. Because there's more heterogeneity in the way climate factors lead to impacts than there is in, say, how greenhouse gases affect climates, there's more uncertainty there as well. This is not distinct from the fact that the base of previous studies to serve as guideposts is smaller. So, whether the mean projected impact of a certain type for a given temperature change is reasonably physically accurate — or whether the maximum or minimum is better — is still the subject of scientific debate. 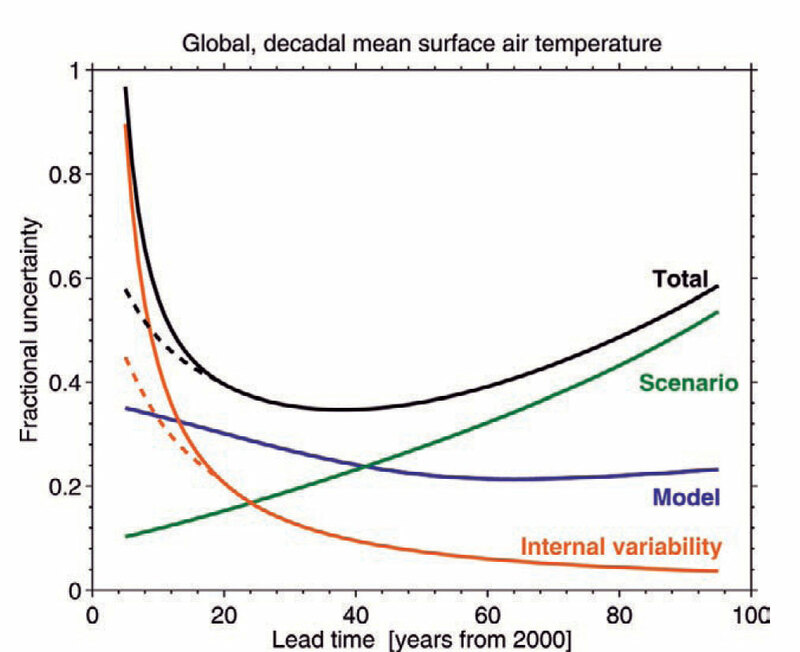 And of course there's the question of what the temperature changes will actually be; climate models contribute relatively little to this uncertainty at timescales beyond about 50 years, at which point human behavior (the emissions scenario) becomes the dominant factor. Nonetheless, despite this two-sourced uncertainty, for both scientific and policy purposes it's important to consider the full range of possibilities, however unlikely we deem them to be. We as a society have overall been very good and/or fortunate so far at avoiding the gloomy predictions of Thomas Malthus and Paul Ehrlich, but we perhaps owe them a debt for galvanizing others to work toward avoiding the sorts of global catastrophes they were worried about. Natural ecosystems, it's true, are a cause for serious concern at moderate levels of temperature increase, not to mention high ones (panel c) — and the implications of this for urban areas weren't taken into account in this paper. However, even as directly concerns cities, we should not be lulled into the time-buying implications of the 'strict case' predictions shown above, despite reservations about assumptions and uncertainties. Mitigation and adaptation are certainly necessary pieces of the puzzle. But just as we actively monitor for disasters like rogue asteroids, despite very low probabilities of collisions, so should we be engaged in preparation for climate-triggered disasters, even if our best guess is that the worst is still several decades away. Here in New York City, Mayor Bill de Blasio announced last week an ambitious plan to substantially increase the city's affordable-housing stock. With continual upward pressure on housing prices, this is a welcome proposition. City planners are hoping that by increasing the supply of housing, low- and middle-income residents will financially be able to remain in the city. The problem is that many of the incentivized areas are low-lying and coincide with areas flooded during Hurricane Sandy (see interactive map at bottom). By comparing the income map (also below) with the inundation, it is apparent that as things stand today, flood-prone areas are dominated by low- and middle-income populations. Nor is this pattern restricted to the New York urban area: sociological studies have corroborated the perception that income is a robust predictor of vulnerability to and suffering from natural disasters, both between countries and within the U.S., due to housing location and quality among other factors. Of course, locations near shores naturally exhibit lower summertime maximum temperatures due to sea breezes, and are thus less dangerous to human health in that regard. In fact, the below map of county-level death rates from all 'natural hazards' does not resemble at all our preconceptions, which are based on faster and more-exciting media-reported disasters like tornadoes, floods, and hurricanes. Coastal cities like New York and Boston, and even hurricane-prone Miami, experience fewer deaths on a per-capita basis than arid, impoverished, sparsely settled counties in the West that are subject to extreme heat. As a slow-moving kind of disaster, sea-level rise is thankfully unlikely to lead to catastrophic death tolls; economic damages, on the other hand, are by all forecasts expected to be severe as seas inch ever higher. And, as has been seen throughout history, floods are squarely in the category of 'things that need only happen once to destroy a place' — unlike, say, heat waves, where some people die but the underpinning physical infrastructure is rarely damaged. So, as with many environmental dilemmas, the question of whether Mayor de Blasio's plan is a well-advised one can eventually be reduced to some form of mitigation or avoidance? Committing to make these huge investments in vulnerable areas amounts to doubling down on the bet that the region's defenses will be able to withstand the biggest storms of the coming decades, for as long as the buildings' useful lifetime lasts (and, if the past is any indication, probably much longer). If this amount of affordable housing can only feasibly be constructed in low-lying areas, then it is justified in the sense that the benefits outweigh the costs, with the benefits probably coming first and the costs becoming apparent later on. In the short-term, enormous economic benefits will accrue to the entire regionwide population of renters, who will enjoy lower rents, shorter commutes, etc. So it's an inherently myopic fix, but most plans are. However, when climates change and risks increase over time, this classic temporal discounting of the political kind should probably be used less — though this is a very difficult mental readjustment to make. There is also the consideration of whether global society should really be cementing a paradigm wherein people with less means are prodded into living in the most climatically at-risk areas. But to not carry out such projects with the excuse of climate change would be to completely forgo a certain amount of (economic) utility because of the possibility of disasters at some unspecified point in the future. Certainly, no plan or preparation is ever perfect. Models can give us the best-estimate probability distribution of flooding of a certain magnitude over a certain future time period, but weighing that information against other needs — like housing for economically squeezed residents — seems to still be best decided by human judgment.